Snake removal is the solution to quite a variety of snakes that are an increasing problem in the South. With the movement of food closer and closer to the homes, there are more snakes coming close to where we live. A common misconception is that there are a lot poisonous snakes. There are in fact no poisonous snakes in the world because poisons have to be absorbed through the body, whether through ingestion or dermal (skin) contact. There are, however, a number of venomous snakes that we can be concerned about in the South. Venom has to be injected straight into the body and can cause tremendous pain and life threatening situations. The dangers of snakes do not even stop at whether the snakes are venomous or non-venomous. Snakes will tend to have loads of bacteria in their mouths which can be transported to humans with a single bite. Most snakes are not overly aggressive, but will defend themselves when threatened. This is why a professional snake control expert is always important when considering snake removal. Identification of the snake is also important because in order to treat for venomous snake bites, the hospital has to know which snake injected the venom to prescribe the correct anti venom treatment. As more and more exotic snakes get released into the wild, it becomes increasingly harder to identify snakes without being trained as a professional snake control expert. 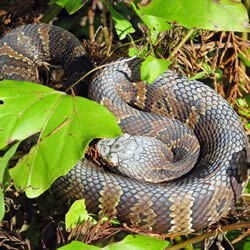 When dealing with snake control, the common reaction is to call someone for snake removal. The problem is not only does the snake not always stay in the area where it was sighted, but also there are usually more than one that are just as likely to show up. When a professional snake removal expert is called to solve the problem of snakes in or around the house, it is necessary to perform full inspections of the property to identify the reasoning for the snake's appearance, which is food, water, or shelter. Once identified, the snake control professional will be able to devise the appropriate treatment that will allow him to provide snake removal and prevent snakes from coming back. Since the need for snake control is so vital in the process, you want to choose a snake removal professional who is licensed with the state to remove these animals and will follow laws accordingly, and also one who is insured with general liability and workman's compensation so that you as the homeowner are covered regardless of any complications that may occur. Luckily, Trapper J is fully licensed and insured for your Peace of Mind. Trapper J, a North Louisiana Nuisance Snake Removal specialist is the most professional and humane nuisance wildlife control service available in Monroe, West Monroe, Ruston, Bastrop, Alexandria, and Pineville in the North and Central Louisiana area.